SRINGERI - Sharada and Shankara Temple SRINGERI - Sharada and Shankara Temple. - Shiva Maha Purana, Vishnu Purana, garuda purana, bhavishya purana, skanda purana. Sringeri, a beautiful little town on the banks of river Tunga, in Chikmagalur district of Karnataka, nestles at the foot of the Western Ghats, in the midst of fields of paddy and climbing palms of coconut and areca, and timber trees. It was once a city with epic associations. The place is said to have been named after the sage Rishyashringa who acted as the chief priest at the great sacrifice made by King Dasaratha to beget sons. Widely known for the Jagadguru Shankaracharya Matha of the Advaita school of philosophy, Sringeri has the temples dedicated to Sharada, the deity of learning, and Adi Shankara. It also has an ancient temple of Vidyashankara with beautiful architecture. On this spot, where hills, land and water form a background of lingering peace, where the day dawns in quiet splendour and the night falls in hushed silence, the greatest of the Acharyas, Sri Shankara Bhagavatpada established the first of his four Mathas. Shankara cognised that the times demanded an integration of spiritual thought in conformity with the ‘Sanathana Dharma’, and he achieved single handed, treading the land from south to north and east to west more than once, walking all the way, restoring temples, reforming the mode of worship, engaging in philosophical discussions with a view to establish the true faith. In order to provide for a continuity of his philosophy and teachings, he founded the four centres of Mathas in the four corners of India, at Badrinath, Puri, Sringeri and Dwaraka, each significantly attached to one of the four Vedas. Of the four Mathas, Sringeri Sharada Peetham was the first in more senses than one. It was the first one started by him. Sureshwaracharya, with whom he discussed various subjects at Varanasi, was installed as its head. Sharada, as Saraswati is being worshipped at Sringeri. Sringeri Matha was patronised by the rulers of several kingdoms. They have made munificent offerings to express their gratitude and devotions. Particular mention may be made about the Vijayanagar kings, the Nawab of Hyderabad, Haidar Ali, Tippu Sultan, the Mysore Wadeyars, the Mahrata Peshwas and the rulers of Kerala. The British have duly honoured the status of the pontiffs and the Matha. There has been an unbroken line of succession of pontiffs for this Matha, all of whom have been men of great knowledge, spiritual attainment, compassion and erudition. Every one of them has added to the lustre of the Matha. Swamis Vidyateertha, Bharatiteertha, Vidyaranya, Narasimha Bharati, Chandrasekhara Bharati, etc. have contributed to the advancement of the Matha. These illustrious Acharyas have carried the torch lit by Adi Shankara in all its glory. In the northern side a more recent temple has been built by the 20th century craftsmen enshrining the highly venerated Sharadamba. This new temple is built in the Dravidian style. 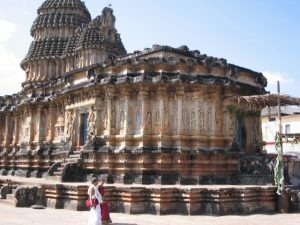 A small 14th century temple of Janardhana closeby is attributed to the Vijayanagara period. There is also an ancient Shiva temple in the town of Sringeri on the top of a hillock. Sringeri also has an old Jain Basadi dedicated to Parswanatha Tirthankara. Little need be said about the spiritual activities of the Sringeri Matha, for it is well known that the pontiffs are veritable oceans of spiritual wisdom to whom people of all types come from all over the world for spiritual advice and for consolation of their sufferings. To facilitate devotees in different places, more than seventy branch Mathas have been established, where Vedic classes, spiritual talks and discussions are conducted. A well maintained library is attached to each branch. Visitors to Sringeri can stay at the guest houses and rest houses maintained by the Matha where free food is also provided without any distinction. Sringeri is very well connected by a network system of transport from various parts of the state. Visitors may also visit Agumbe near Sringeri and enjoy the charm of nature and the magnificent view of the sunset.